Bounce Academy is proud to host an annual Men’s and Women’s Gymnastics competition, Bounce Gymnastics Invitational. We hold our competition in our spacious 36,000 square foot facility. The Facility was designed so these events are spectacular and enjoyable for all! Bounce has 2 full FIG Floor Exercises, 2 FIG Vault Systems, 2 FIG Uneven Bar Systems, 3 FIG Balance Beams set up for the women’s competition. 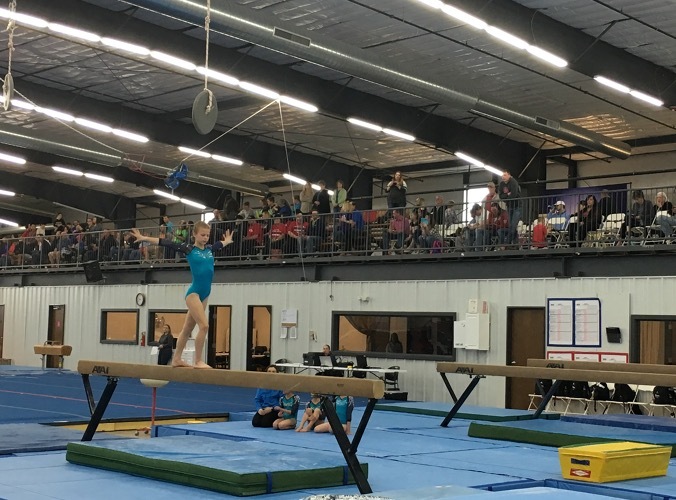 Bounce has 2 full FIG Floor Exercises, 2 FIG Pommel Horses with 2 fully padded mushrooms, 1 FIG Ring Tower with addition warm Rings, 2 FIG Vault Systems, 3 FIG Parallel Bars, and 2 FIG Horizontal Bars. Bounce has a 6,000 square foot Mezzanine for competition viewing. The mezzanine allows for excellent viewing of all the events. There is plenty of space for standing, sitting in your own chair or the spacious bleachers. The mezzanine also hosts vendors during the competition: t-shirts, coffee, pictures, snacks, etc. Bounce takes the coach’s weekend into deep consideration. Our hospitality room is easy to access during the competition at any time. We serve breakfast, lunch, dinner, and snacks. We strive to feed coaches and judges in attendance delicious satisfying meals. All scoring is done digitally. We have a large scoreboard with an excellent format for score posting. You won’t miss any of your gymnast’s scores. Scores are also displayed during awards to help keep parents informed. Each year custom awards are selected that represent that year’s competition. Refreshments are sold during each session. We offer a variety of food and drink to appeal to all spectators, young and old. For those that don’t find a spot in our spacious asphalt parking lot, overflow parking is available on property. Our sanctioned events are judged by USAG certified men and women.